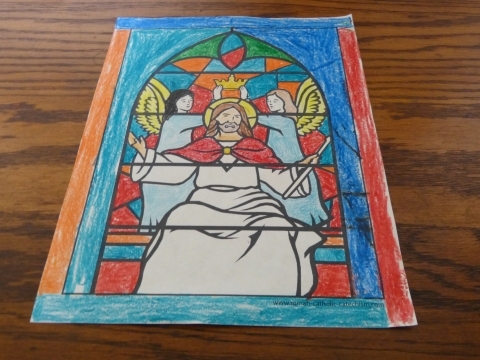 Jesus Christ King coloring page for the feast of Christ the King. 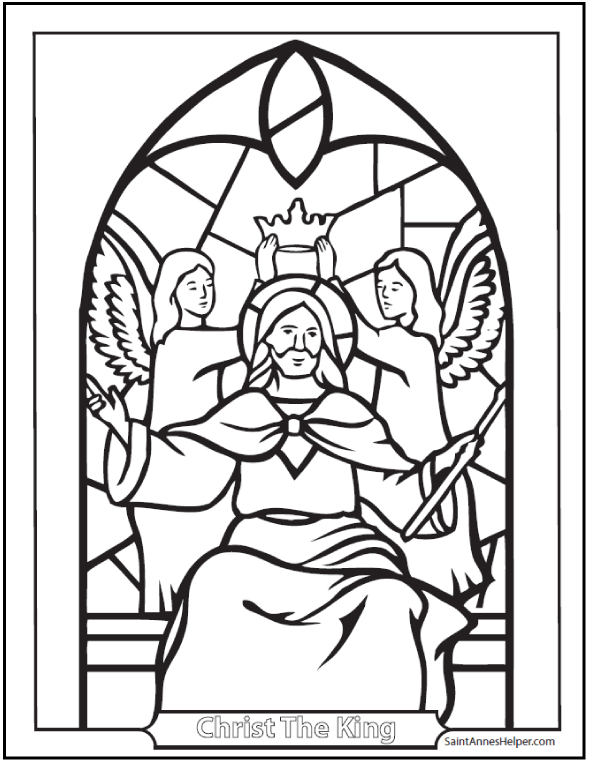 Angels crown Jesus Christ king of kings in this coloring page. Celebrate Christ the King Sunday! See the words to two hymns and Handel's King of Kings lyrics below the coloring page.This PDF prints 8.5x11" single sided. Jesus Christ is our King. Long live Christ the King! Exaudi, Christe. Ecclesiae Sanctae Dei salus perpetua. Redemptor mundi, Tu illam adjuva! 1. Sancta Maria: Tu illam adjuva! 2. Sancte Joseph: Tu illam adjuva! 3. Sancte Michael Tu illam adjuva! All repeat: Christus vincit! Christus regnat! Christus imperat! Exaudi, Christe. Pio summo Pontifici et universali Papae vita! Salvator mundi, Tu illum adjuva! Sancte Petre, Tu illum adjuva! Rex regum! Sancte Paule, Tu illum adjuva! Rex noster! Repeat: Christus vincit! Christus regnat! Christus imperat! Gloria nostra, Misericordia nostra! Auxilium nostrum! Fortitudo nostra, Ar ma nostra invictissima! Murus noster inexpugnabilis! Defensio et exaltatio nostra! Lux, Via, et Vita nostra! Ipsi soli imperium, Laus et jubilatio per infinita saecula saeculorum. Amen. Christ Lord of glory, Christ Prince of nations, Christ our King of kings! Christ Jesus, hear us. Perpetual safety and welfare to the Church of God. Redeemer, Savior. Assist and strengthen her. O Mary blessed Mother. Assist and strengthen her. Joseph holy guardian. Assist and strengthen her. Blessed Michael patron Assist and strengthen her. 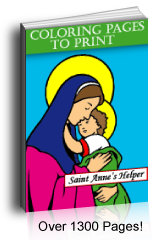 Blessed Saint Patrick: Assist and strengthen her. Repeat: Christ Prince of nations, Christ our King of kings! Christ Jesus hear us. Life and health and blessings to Pope N. our Holy Father. Redeemer Savior, Assist and strengthen him. Blessed Peter, Assist and strengthen him. King of kings! Blessed Paul, assist and strengthen him. Christ our King! Jesus our glory, Fountain of grace and all mercy. Source of all our blessing. Defender in battle, Strong arm of our God invincible. Our stronghold and our exaltation. Our captain leader who has won our salvation. Christ Jesus, our life and light eternal. To Him only is victory all praise and jubilation. Through all the endless ages of eternity. Amen. Abundance of good things be ours. The peace of Christ be ours. Redeemed by the blood of Jesus. Proclaim our joy. May His holy kingdom come. Praise be to our God Amen. Hallelujah, hallelujah, hallelujah, hallelujah, hallelujah!